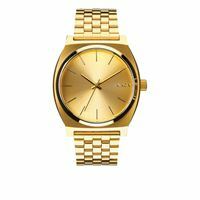 An original Nixon design, The Time Teller is a tried and true crowd favorite. The Time Teller's clean lines cut through cloudy philosophy, while its simple, high concept design keeps things precise.Features: 3 Hand Quartz, 37 mm, 100 meter / 10 ATM (custom Stainless Steel Case), and 13-18 mm Custom 5 Link. 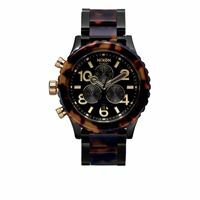 Good looks, brains and brawn combined The 51-30 Chrono rates second-to-none. Featuring a 6 hand Japanese quartz movement, a second subdial, chrono and date means you're equipped for any mission. Nixon's unique crown positioning on the left side of the bezel for added comfort and to avoid wrist bite plays up the little details we strive for and further strengthens our team-design, custom-built point of view.Features: 6 Hand chronograph, 51 mm, 300 meter/30 ATM (custom Stainless Steel Case), and 25mm 3 Link. While it's true that you never know what is going to happen, The Sentry Leather covers most of the bases, providing protection from most everything that could happen within the seconds, hours, days, weeks, and months of the regular calendar. It's your won't-quit, always obedient, ever-watchful, and timely guard against mayhem. Unless otherwise ordered.Features: 3 Hand Quartz, 42 mm, 100 meter / 10 ATM (custom solid Stainless Steel Case), and 23 mm Leather Band With with stainless steel buckle.